Commercial drone data users in construction, mining, energy, and beyond: we have an exciting announcement for you. The Skycatch Explore1 precision mapping drone, part of the High Precision Package, is being manufactured by global drone powerhouse DJI. Production is already underway at DJI’s world class factory in Shenzhen. The first units are being built and delivered to heavy machinery giant Komatsu. This is also the first time DJI has agreed to partner with a company to manufacture a custom drone. 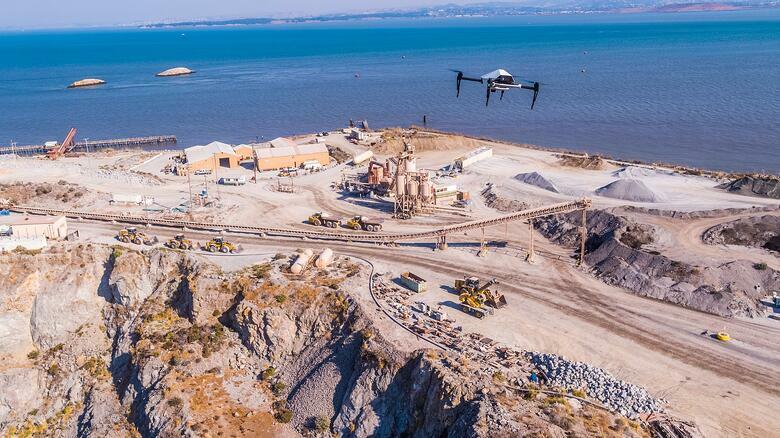 The Skycatch Explore1, manufactured by DJI, taking off on a construction site. The Explore1 drone is part of the Skycatch High Precision Package (HPP), which was developed as an enterprise-level turnkey solution for highly accurate data at scale. HPP also includes the Flight1 iOS app, the easy-to-use mission planner, Edge1 RTK base station, unlimited cloud-based processing and powerful data export and analysis tools. Skycatch Air1 onboard computer which ties together the positioning from the high-precision GPS and the timing from the high-res camera, as well as interactions with the onboard flight controller, so each photo position is recorded precisely. This enables users to capture and process data at centimeter-accuracy, out of the box. Skycatch Sync1 camera system, which features a high-res 20MP camera which has an ultra-fast shutter that captures at twice the speed of existing solutions. Skycatch Edge1 combined RTK base station and GPU-based point cloud processing unit. Generate accurate point clouds and maps faster than any other method, automated and accessed through a simple iOS app. The High Precision Package can generate highly accurate point clouds that you can bring into any BIM/VDC workflow. The Explore1 also takes advantage of the Matrice 100 gimbal, allowing for the use of DJI’s X3, Z3, and XT cameras for simultaneous capture of oblique imagery and inspection use cases. Utilizing this dual camera setup, the Explore1 can capture imagery for 3D models 2 times faster than single-gimbaled cameras. Additionally, Edge1 utilizes RTK networks and eliminates the need for ground control points, while maintaining sub 5cm accuracy. This means you no longer have to lay down GCPs, survey GCPs when they are displaced, or tag GCPs in the upload process, saving countless hours and labor costs. The Explore1 generates high-accuracy job site data in a fraction of the time it takes traditional methods. Explore1 is already deployed on Smart Construction job sites, autonomously flying overhead to create highly accurate 3D site maps and models. The drone data integrates with Komatsu’s Smart Construction robotic earth moving equipment to enable the equipment to precisely dig, bulldoze, and grade land autonomously according to digital construction plans earthwork stage of the construction process. Komatsu has deployed Skycatch systems for over 3 years. Explore1 is a combination of all the learnings from our users over this time period, focused on ease of use, and time to usable data. Explore1 is used to digitize the construction site during all phases: planning, construction, and completion. Planning: Before any construction work is started, the site is digitized with the help of the Explore1 so that the architects and site engineers can design the site accurately, with real life details. Before this, they could only look at a blueprint (line drawing). Pre construction: A large site, such as 40 hectares, can take 2 people 1 week using traditional survey methods. This can be risky due to the need to climb all over the site, and usually there is only 1 point measurement per every 50 m. The process does not capture any contextual detail such as grass, dirt, road, or streams. Skycatch can map the same area and capture the site in digital format in 3 hours: 1 hour to plan and fly, 1 hour to process, and 1 hour to review data with the customer. When data is delivered, a full color 2D and 3D map is delivered plus point measurements up to 400 points per square meter. This is a time savings of 20x - with much more site information delivered. Construction: When the design is finished, the exact amount of work to be done (m^3 of earth to be moved) is known. Therefore budgeting the project is more exact, and the owner and builder can agree on a total price more easily. During construction, the Explore1 will fly every day to monitor the work in progress. Komatsu’s SmartConstruction system combines the site measurements from the drone plus data from the machines on site, and compares it with the finished design. Each day, the exact amount of work completed is known, and the next steps are planned automatically. This “closed loop” feedback has never been possible before, and it prevents schedule or cost overruns and improves the final quality of the work. Logistics Planning: By monitoring the site every day, the site foreman can understand what space is available to bring new material on the site. So, when the project schedule is ready to have the material moved on site so it can be installed, the foreman can easily show the supplier exactly where to bring the material, so it does not need to be placed in a holding area before being installed. If this is a large site, simply moving the material from the holding area to the place where it should be installed can take hundreds of man-hours. So, up to a 10% improvement in labor cost can be avoided from double-handling. On large sites, this can be $500,000 in savings. Completion: When construction is finished, the actual work can be compared with the design, to make sure completion is exact. 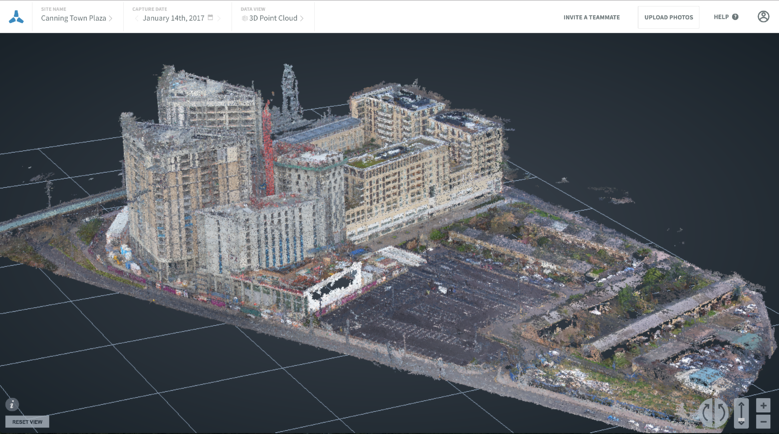 Also, Skycatch creates full documentation (2D map, 3D model) for keeping a record of the “as-built”. This is given to the owner and the government in most cases. Read additional coverage about the announcement at The Verge. Are you ready to optimize your job site with the High Precision Package? Contact us at sales@skycatch.com to get high precision drone data on your site.